Single point flare tips are generally positioned vertically and connected to the end of an elevated flare riser/header. 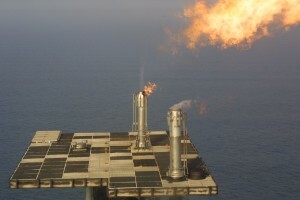 Offshore, single point flares are sometimes inclined when positioned on the end of a flare boom in order to direct the flare flame away from the operating platform. They can be either subsonic pipe flares (section 2.1) or sonic single point flares (section 2.2). Multi point flare tips are generally sonic fares and offer improved performance with respect to radiation, noise and smokeless operation by routing the gas to a number of smaller diameter burner nozzles. Breaking up the gas flow into smaller streams enables greater air to hydrocarbon gas contact and therefore aeration of the flared gas in the combustion zone. The resulting radiation from a multi point flare can be up to 40% lower than that of a equivalent single point tip. Similar to single point flares, these flare tips are generally positioned vertically with a flanged connection at the top of an elevated flare riser/header. More information on these flares is provided in section 2.3. Coanda flare tips were first developed by BP’s flare department in the 1960’s for use on their North Sea production platforms. The design proved popular among the operators and BP set up a subsidiary company to market the product world-wide. The design uses the Coanda effect to entrain large volumes of air into the gas stream, producing a single clean burning compact flame. The variable slot version of the design extends the effective operational range ensuring efficient operation at turndown conditions. These flares gained widespread use in the 1980s and 1990s and are still widely used on offshore installations. Although these can generally be considered as single point sonic flares, their unique design merits a category of their own as seen in section 2.4. Vent tips are generally an unignited single point flare either sonic or subsonic and are covered further within section 2.5. Enclosed flares and many other types and derivatives of flares including steam assist, air assist, gas assist, low BTU and water injected flares are available and these are summarised within section 2.6.